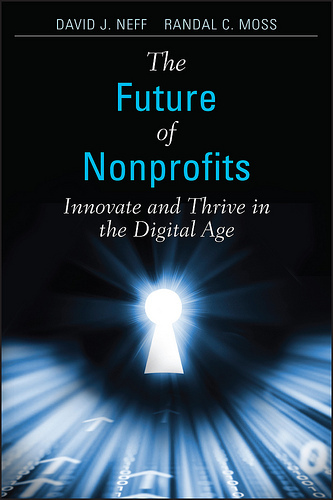 The Future of Nonprofits: Innovate and Thrive in the Digital Age is a new book by Randal C Moss (@randalc) and David J Neff (@daveiam). In it, the authors strive to unravel the mystery around how nonprofit organizations innovate and implement new ideas. It provides a roadmap for nonprofits to create a system to encourage innovation–a place for new ideas to be judged, tested, funded and eventually launched. The book begins by defining the concepts of strategy vs. futuring. Nonprofits must anticipate future states so they can be prepared to capitalize on emerging opportunities in the marketplace. Rather than focusing on contingency plans, Moss and Neff point out that organizations must plan for all (or at least the most likely) future states. Futuring helps organizations to define the environments in which they can expect to be operating. The book describes how nonprofits can create their future through innovation, tolerating waste, and creating an organizational culture that welcomes change. 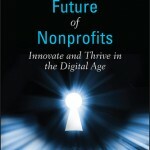 The book also discusses several major roadblocks to nonprofits effectively innovating. One of these obstacles is having an operational mindset which is focused on productivity and execution–missing slow, incremental changes that build up over time. Overburdened staff are busy focusing on day-to-day tactical activities, and organizations don’t allow for the nurturing and implementation of forward-thinking ideas. Moss and Neff explain that executive support is key factor to successful innovation – staff must have buy-in from the top down as well as laterally across departments. For example, if implementation will need IT support, communicating early with IT along innovation stages/timeline can reduce pushback. The book even suggests ways staff can use their Board of Directors as an extra set of eyes to spot trends and changes that will affect the way the organization operates. To take that next step, Moss and Neff suggest nonprofit leaders must move past metrics that measure success based on income/revenue alone and instead, focus on engagement. Understand the motivation of your constituents and get close to their experience. Rather than simply looking at how constituents currently interact with your organization, look at how they would like to interact with you. While many traditional (for-profit) management theories eliminate waste from organizational processes, Moss and Neff instead profess that “waste is wonderful!” (pg 49) The book points out examples of companies like Google, which encourage staff to spend up to 20% of their time pursuing things they are passionate about. The process of rapid innovation which results from this freedom enables staff to take advantage of opportunities that may have otherwise been missed. Innovation is not something that can be run in a side department or as an ancillary program. This review only scratches the surface of what is covered in this very timely book. There are interviews with nonprofit leaders from American Cancer Society, Nonprofit Technology Education Network (NTEN), American Red Cross, and others to get perspective on what current nonprofit leaders are doing to support innovation. There are also specific recommendations of blogs, conferences, and websites with resources about nonprofit innovation and identifying future trends, in general. Readers will come away from this book with the confidence that you don’t need an expert to create an innovative organization. Managers must encourage a willingness to be aware of your current situation, an eagerness to explore opportunities, and have a tolerance to fail. This book shows there are opportunities to solve massively complex problems with simple technologies and it gives organizations a roadmap for creating an environment where innovative ideas are encouraged, evaluated, and finally implemented. This entry was posted in Book Reviews and tagged economics, futuring, nonprofit management, public policy, strategic planning, tech on May 27, 2011 by stacydyer. From a book reading (click for official SXSW archive recording) of The Future of Nonprofits : Thrive and Innovate in the Digital Age with Randal C. Moss (@randalc) and David J. Neff (@daveiam) I learned that nonprofits are still businesses, they just spend their profits differently.They cannot be lazy when it comes to new initiatives. Charities also must pay attention to the rise of the individual fundraiser. Don’t be satisfied for supporters to simply like your cause, engage them and call them to take action. Awareness is dead. Advertising is in. Organizations must make a business case for each new idea. Ask; is it revenue positive or revenue neutral? Is it sustainable? If you are not structured to innovate, you won’t innovate.Organizations must create cultures that encourage new ideas from staff and have procedures in place which facilitate the adoption of new ideas. Check out the slideshare from David J Neff. Or for more tidbits of knowledge, 140 characters at a time, read the comments on the Twitter hashtag, #thefutureofnpos. 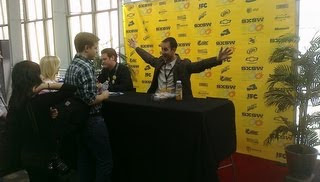 This entry was posted in Session Wraps and tagged futuring, nonprofit management, sxsw on March 23, 2011 by stacydyer.